Ginger is one of the herbs that lower blood pressure. According to many researchers, herbs are effective against hypertension and are generally safe to use. Here are some essential facts about ginger’s healing powers and a popular recipe for ginger lemon tea with honey. Find out how this herb works on your system. 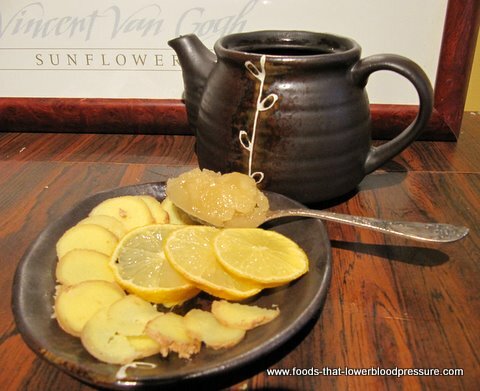 Ginger lowers blood pressure in several ways. Ginger root has an anti-cholesterol property (Castleman et al). It helps to reduce the overall cholesterol level, including low density lipoproteins. Hence this herb helps to lower blood pressure by preventing plaque build-up and maintaining the elasticity of blood vessels. It also prevents inflammation of the blood vessel walls, thus lowering blood pressure by keeping blood vessel walls healthy and elastic, so that they can regulate blood pressure properly by expanding and contracting. Ginger lowers blood pressure by maintaining a smooth blood flow, preventing the formation of blood clots which can clog the arteries and small blood vessels. The potency of this herb is even higher when combined with garlic and peppermint, according to Castleman. A low sodium diet is effective, but very hard to follow. Ginger lowers blood pressure because you can use it as an alternative when you need to restrict salt in your diet. It adds flavor to your food and helps you minimize the use of salt, thus helping to keep your blood pressure in a normal range.Many people make meals and teas with ginger part of their DASH diet meal plan. In the study of Ghayur MN, et al, ginger lowered blood pressure through the blockage of voltage-dependent calcium channels. They used a crude extract of ginger in this experiment, which caused a significant decrease in the arterial blood pressure. So are you enjoying the spicy taste of ginger? In addition to its anti-hypertensive properties, ginger has many health benefits that you can enjoy just as generations of people did before you. It is believed that this herb has the highest antioxidant properties, and it is effective in preventing colon cancer as well as in ovarian cancer treatment. Ginger is also used as a natural remedy for nausea among pregnant women; it relieves motion sickness, heartburn, and migraine attacks. Several studies showed its effectiveness in reducing inflammation and pain, because it blocks the prostaglandins that can cause pain perception. Ginger also benefits patients with arthritis, and may help prevent diabetic nephropathy among diabetics. A researcher at Cornell University Medical College discovered its anti-blood clotting property, which is similar to that of aspirin. Ginger essential oil has also been used to promote better digestion, for sore throat, loss of appetite, rheumatic pain, and for cold and flu relief and prevention. It can be used by adding to the bath directly, as a facial steam, or directly massaging the ginger oil into the affected area. Be cautious when using pure essential oils; it is recommended that they be diluted in another carrier oil (olive, almond, jojoba, etc) when applied directly to the skin or taken internally. Use fresh ginger, avoid dry and wrinkled ones, and wash it very well with clean water before using it. Use in moderation while enjoying its amazing health benefits! Please be sure to consult with your doctor whenever you use this herb, especially if you are taking other medications such as blood thinners (warfarin). Combining medications with too much ginger can cause side effects such as upset stomach and nausea. As you can see, ginger is popular not only for its unique spicy taste, but also for its wide array of health benefits. There is a variety of simple ginger recipes that you can try at home. Ginger tea is one of them. Start by making 10 to 15 slices of fresh ginger root; add 2 cups of water, one slice of lemon and one or two teaspoons honey. This ginger recipe is widely used because it is the most convenient and the easiest to prepare. It comes out a bit concentrated, so that you can add enough water to your taste. Prepare it once and use it for a day or two. How much more convenient can it get? Does Anxiety Cause High Blood Pressure? Disclaimer. No information provided by Foods-That-LowerBloodPressure.com in any article, show, video, recipe, and/or other product or service is a substitute for medical advice or treatment for any medical condition. It is for information purposes only and is not intended to diagnose, prescribe or treat your health condition. Please seek other sources of information before making health care decisions. If you have a health condition, you are advised to seek other medical opinions from health professionals before making any changes in your health regimens. Reproduction of any information on other websites without author's permission is PROHIBITED. Reproduction of recipes is allowed only in blogs and websites that provide a do-follow link back to Foods-That-LowerBloodPressure.com.